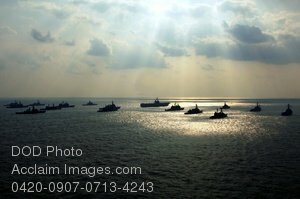 Description: Free, public domain image: American and Japanese Self-Defense Forces Ships on the Philippine Sea. PHILIPPINE SEA (Nov. 16, 2007) Nineteen American and Japan Maritime Self-Defense Forces (JMSDF) ships transit together at the end of ANNUALEX 19G, the maritime component of the U.S.-Japan exercise Keen Sword Õ08 for a group photo. The exercise was designed to increase interoperability between the United States and JMSDF and increase their ability to effectively and mutually respond to a regional crisis situation. U.S. Navy photo by Mass Communication Specialist Seaman Stephen W. Rowe.